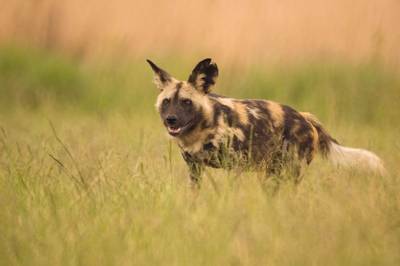 After watching the 'Painted Wolf' episode of the Sir David Attenborough narrated series 'Dynasties', we discovered – as if we didn’t already know – that it’s a dog-eat-dog world out there in the African savannahs, and specifically the Mana Pools National Park, in Zimbabwe. In the case of the Painted Wolf, more usually known as the African Wild Dog, we learned that a daughter can be turned against her mother, so much so that she risks the lives of her entire pack in a bold, protracted and highly personal campaign to drive her away. It was an extraordinary tussle, but you couldn’t escape the background story – that the amount of land suitable for this most peripatetic of African hyper-carnivores is fast shrinking in the modern world. African Wild Dogs live in large packs, and their preferred method of hunting, by wearing down medium sized grazers by exhausting chases that can last for an hour, requires a very large home range (400-600km2). In the featured story, the daughter Blacktip, emboldened by her pack size of 30 individuals, covets her mother Tait’s territory. In a thrilling ambush operation, she succeeds and drives her mother and 15-strong pack into a neighbouring territory infested by the Wolves’ most dangerous natural predator, the Lion. That’s not the end of the story, though…but you had better watch the programme to follow the twists and turns! The sheer brutal nature of life in this deceptively gorgeous location (the sunsets and thunderclouds were simply stunning) was shown by the death count. The dogs didn’t eat the dogs, as it happens; but it did seem that everybody was eating everybody else. Hyaenas ate young Wild Dogs; the Wild Dogs ate the Baboons; the Lions would have eaten the Dogs but instead ate the Buffalo. Everybody, but everybody, eats Gazelles and Impalas. And the Crocodiles, which are fast becoming the classic background baddies in the series, are merciless. And even Elephants provided the odd problem. Apparently, their heavy bodies create large footprints that harden in the sun, providing dangerously pitted ground for fast-running carnivores. 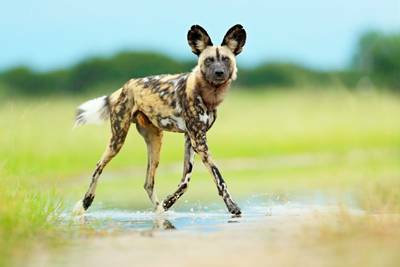 African Wild Dogs can run at 60km/h. One of the Dogs featured in the documentary broke its leg during a hunt. For just about every other animal in this, or any other ecosystem, such a serious injury would prove fatal, often leading to a slow, painful death. However, remarkably, African Wild Dogs are almost unique in their tendency to look after sick and crocked pack-mates. Last week, remember, a mother Lioness had to abandon a poisoned youngster; this week the pack-mate was cared for and fed to good health, and this is typical of an animal with such strong social bonds. Pack-members would even lick each other’s wounds. All pack members contribute to the feeding of pups and other youngsters, bringing it to them or stepping aside for a junior member to eat. 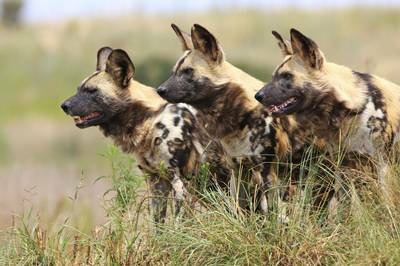 If you saw the programme, you must surely be desperate now to see a pack of African Wild Dogs for yourself. It isn’t easy. As Sir David reminded us, there are now only 6,600 of these handsome carnivores left in the wild, and only in a handful of places could they be described as thriving. Furthermore, even where common they are difficult to track down, since they move around so much within their home range. Nevertheless, we run a number of tours where African Wild Dogs are a possibility, and some of these are listed below.